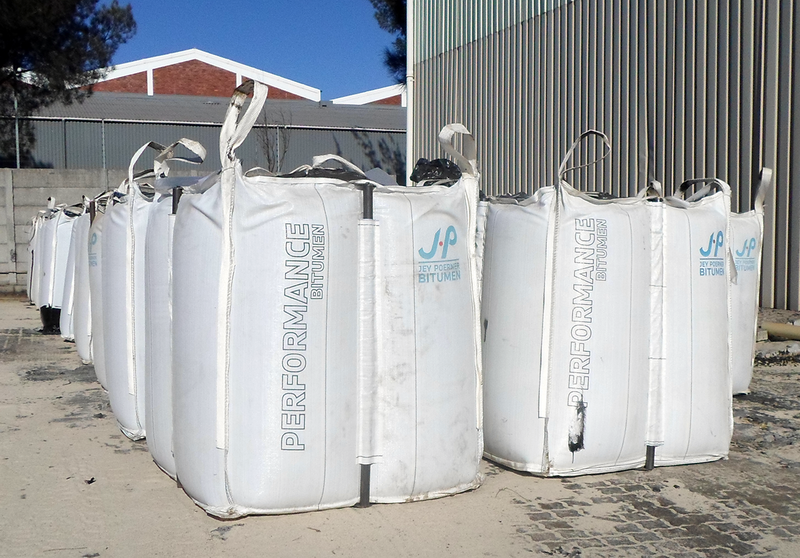 The Pörner Bitumen Packing System (PBPS) consists of a complete solution that is designed to pack road-paving bitumen into the flexible containers (Pörner Bitumen Bag™) and transport it by any means of transportation. 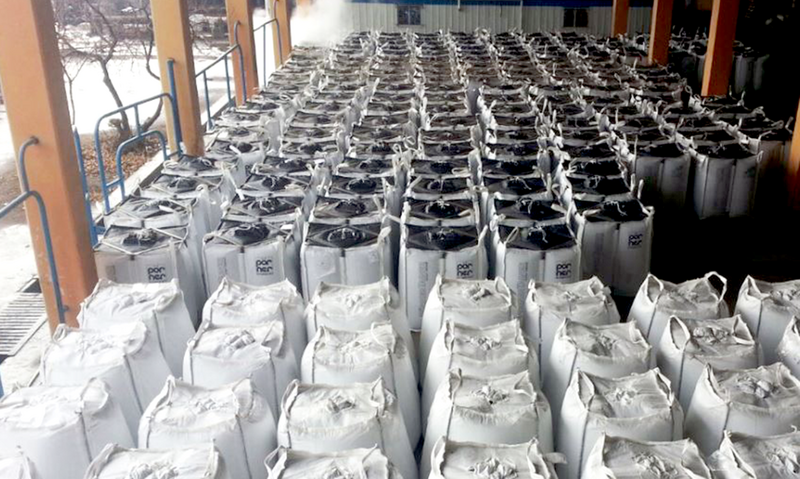 At the end of the supply chain is the Melting Terminal, a small plant consisting of a storage yard and an efficient Pörner High-Performance Melting Unit to melt the bitumen again just in time. 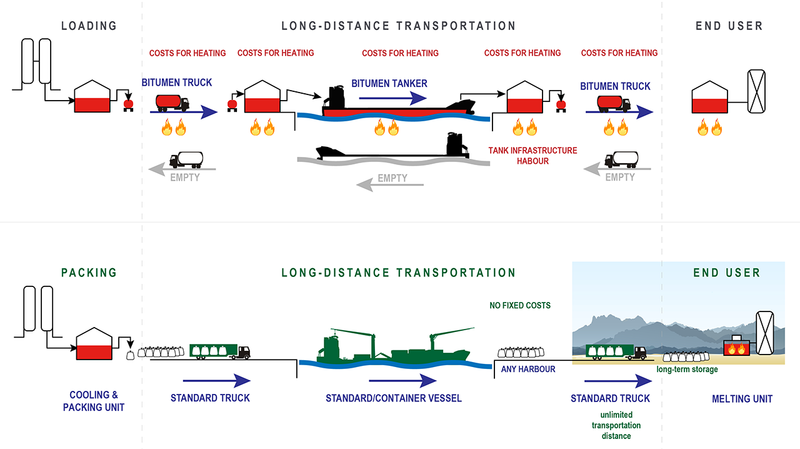 From there, the "last mile" to the end-user is covered by road tankers or the client operates the melting unit himself. The quintessence of the Pörner Bitumen Packing System is the one-way transport of bitumen in cold condition in an environmentally-friendly, flexible, lightweight and economic container. The Cooling & Packing Unit (CPU) is the first step of the PBPS. It is a small process plant designed by Pörner Group and is typically placed in the vicinity of the bitumen production facility or within the refinery to provide feed of the hot bitumen to be packed into bags. The plant works semi-automatically and is electronically controlled to fill, weigh and register each bag. 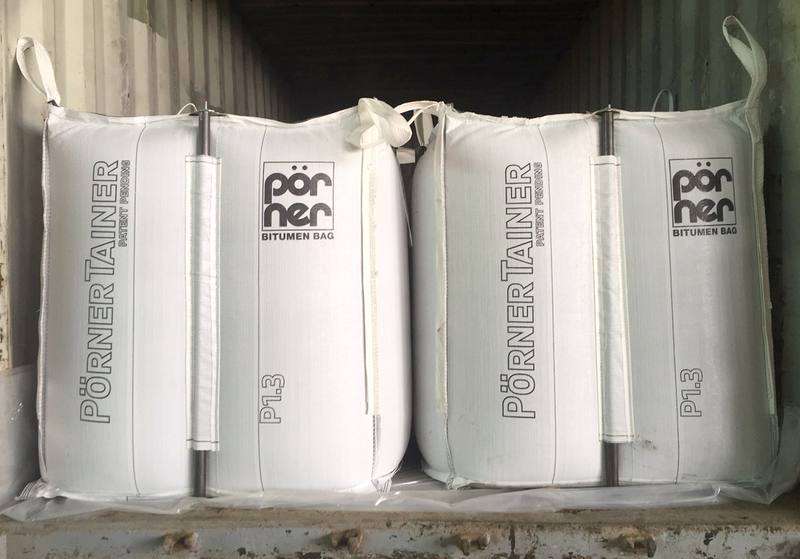 The Pörner Bitumen Bag™ is the actual container of the PBPS. It is a flexible bag container, self-stabilizing and UV-protected, that enables efficient and economic one-way transportation and storage in cold condition. The bag is designed for a gross weight of up to 1,300 kg. The bags can be stored in cold condition in any weather. Only requirement is a flat, compacted surface. 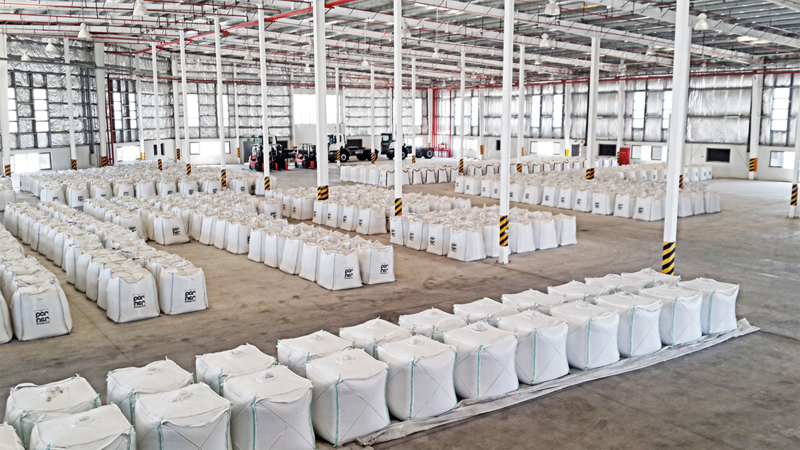 The bags are UV-protected and can be stored up to 12 months outside. For a prolonged storage period, we recommend covering the bags or store them under a roof to avoid direct sunlight. The Melting Terminals cover the "last mile" to the client and relief him from bitumen logistics. The Melting Terminals function as bitumen terminals and storage facilities. Basically, they only consist of the Pörner High-Performance Melting unit and storage space. In most cases, the end-users (e.g. construction companies and asphalt producers) wish to have the bitumen supplied liquid and just-in time according to their demand. The Melting Terminal with a small one-time investment provide everything to service the end-user ideally. 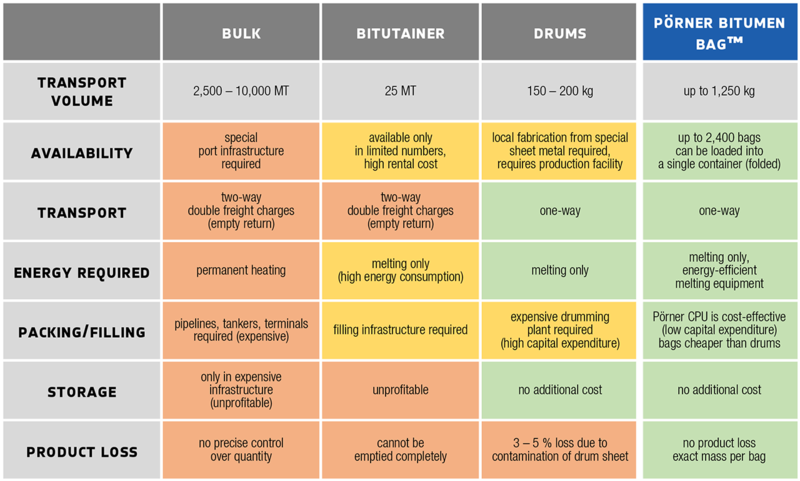 This illustration shows the obvious advantages of the Pörner Bitumen Packing System (PBPS) with the Pörner Bitumen Bag™ over conventional bitumen logistics.